The new amendments to the Tax Code of Ukraine introduced a new approach to system of planning tax audits. Yes, the schedule of documentaries scheduled inspections prompted by a year, will be open to all Internet users by publishing on the official portal of the Ukrainian State Fiscal Service. Please note that the schedule of documentaries scheduled inspections, according to p. 77.2 art. 77 of the Tax Code of Ukraine will be included, by selecting taxpayers accordingly to the risk of taxes and fees non-payment and non-compliance with other legislation. 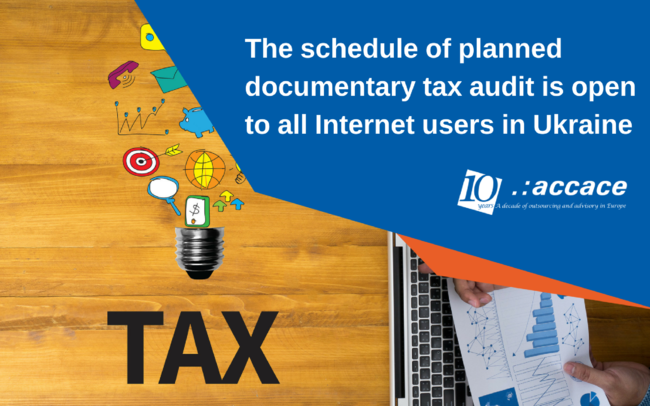 Frequency of documentary scheduled audits of taxpayers will be determined based on the degree of risk of such taxpayers. The risk is divided into high, medium and low. It has a decisive influence on the frequency of inspections. Formation of the schedule of documentaries scheduled inspections of taxpayers’ regulated by “Procedure of the plan-schedule of documentaries scheduled inspections of taxpayers” approved by the Ministry of Finance of Ukraine from 2 June 2015, the number 524. This document includes the criteria for the companies, in order to divide them into companies with high, medium and low risk of taxes non-payment. According to the provisions of Law 1797, p.77.1 art. 77 of the Tax Code of Ukraine, it is established that the schedule of documentary planned inspections for the current year is published on the official website of the central executive authority that implements the state tax and customs policy until 25 December of the year preceding the year in which such documentary checks will be conducted. Follow Accace Ukraine on Linkedin! Minimum wage in Ukraine 2017 – What does the law say about benefits for part-time employees?